The comfort and pleasure of a heated seat is now available for motorcycles of all types and sizes. A Seat Heater provides comforting warmth to the rider through the seat's cushion. These seat heaters are thoroughly tested and manufactured to meet strict government and vehicle manufacturer standards for safety, durability and performance. Standard kits come in sizes to fit almost every motorcycle including these two most popular sizes. This single temperature motorcycle seat heater kit has a bi-metal thermostat for temperature control. The heaters quickly warm the seat for rider comfort on the coldest days. The soft and flexible seat heater elements will compliment the comfort and support of the existing seat and provide therapeutic warmth to the rider when switched on. Everything needed for installation including parts, hardware and instructions are together in each Standard kit. The on-off rocker switch is waterproof and can be installed for easy access or it can be hidden from view. Once the desired temperature is reached, the seat heater can be turned off. We now offer a dual temperature motorcycle heater kit with features usually found only on luxury cars. The key component in this new kit is a waterproof digital temperature controller that provides more consistent and controlled heating. The system features two tightly regulated temperature levels, high and low, for rider comfort. The controller also has an automatic shut-off function after 1 hour of continuous operation and is capable of providing diagnostic feedback. The digital control module will maintain the high or low temperature setting selected at the switch. This provides continuous comfort without the need for manual adjustments. The Luxury kit comes with all the parts, hardware and instructions for easy installation. 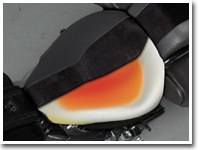 Every Motorcycle Seat Heater is backed by the leading manufacturer of aftermarket seat heaters in the country. This Product is warranted to be free from defects in manufacturing and workmanship and is guaranteed to work for three years or 36,000 miles, whichever occurs first. This Limited Warranty covers the repair or replacement of the seat heater components only, and does not cover any costs related to or damage resulting from the installation of the seat heater. Custom designed seat heaters must only be used in seat applications for which they were designed, failure to properly install the designated seat heater product, or improper installation or misuse of any component, will void this Limited Warranty.